« Groupon, Group Off — Enough Already! Will Instapaper save me or ruin me further? I ask because I’m a hoarder. Not one a big enough one to merit a reality show, not one of those disheveled types (does hoarding and dressing poorly always go together?) with dozens of feral cats and other critters living amid trash-packed rooms. No, I’m different. I’m an information hoarder. The clutter continues inside my computer(s). The files and folders related to my professional pursuits are pretty buttoned up (money is always a good motivator), but the rest of my digital world operates on chaos theory. And nothing is messier than the hundreds of bookmarks that run downward and downward on the left side of my browser. Each is something I find interesting, compelling or entertaining, and something that some day I will read, perhaps again, perhaps for the first time, and cogitate upon. You bookmarkers out there know that compiling these links is laborious (two clicks at least) and organizing them even more so. Who uses the Organize Bookmarks page anyhow? The result is an endless list of links, which as it grows and grows becomes a better source of guilt about ideas unfulfilled than of knowledge gleaned. So, I’ve switched. 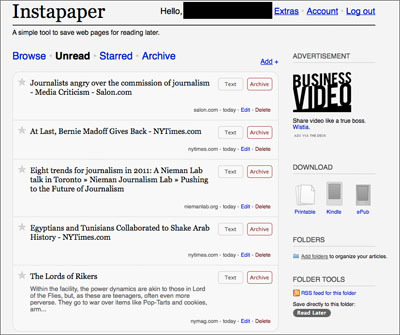 Good-bye bookmarks, hello Instapaper. So long Command D, welcome Read Later. Now I’ve got a graphically pleasant, easy-to-read page of articles from the Times, Wired, the New Yorker and Salon. True, I subscribe to some of these publications, but they sit in a pile somewhere and it can be so tiresome to actually have to open them in order to find the content amid all that advertising. The nicely ordered list that Instapaper makes just seems so much … smarter. And that’s why I want to read this stuff in the first place, which I will – some day. This entry was posted in Journalism, Personal and tagged hoarder, Instapaper.